We are a community group that works for the conservation of bats and their habitat through rescue and landcare work, advocacy, education and research. 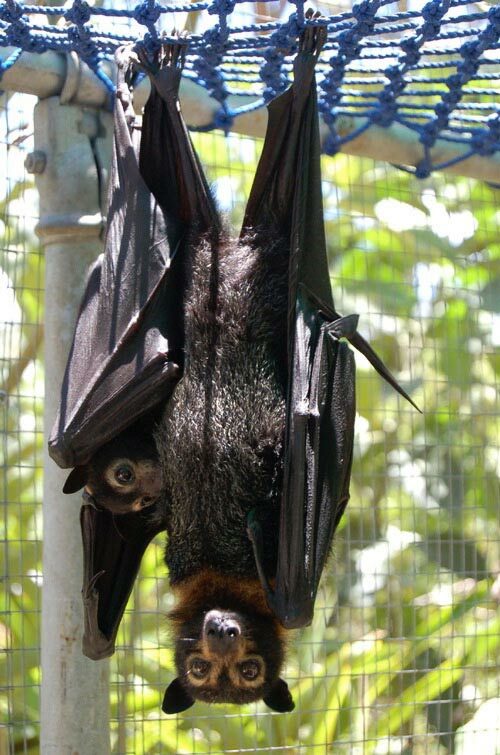 Our activities began in a small way in 1990 when the local paper reported that hundreds of young spectacled flying-foxes had been orphaned by tick paralysis. The adventure began with 2 orphans but over the next 10 years morphed into a life’s passion for our founder. We originally worked with bats from the Tolga Scrub and hence our name. 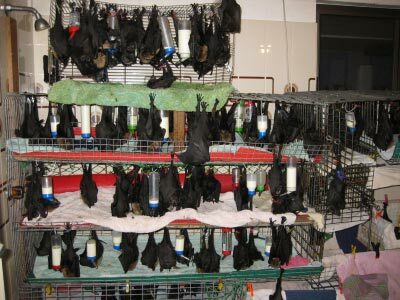 This became confusing when we opened the visitor centre in 2009 as we are not at Tolga, and so we called it The Bat Hospital Visitor Centre. 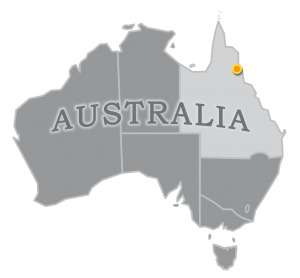 We now work with all bats, megabat or microbat, from this region and afar. Bats come to us from remote rural areas many hundreds of kilometres away, and occasionally for sanctuary when retired from zoos. 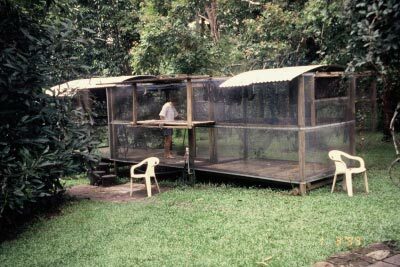 We followed in the footsteps of Friends of Far North Flying Foxes. This group was very active in the 1990s, working mainly centred around the colonies at Zillie Falls and Whiteing Road on the southern Tablelands. 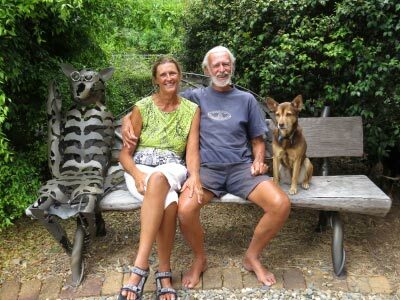 In 2002 they folded and voted to transfer their funds to Tolga Bat Rescue and Research Inc. Ann and Bruce Johnson, the mainstay committee members, left a legacy of very informative newsletters. We became incorporated in 2002 as a not-for-profit community group, listed on the Register of Environmental Organisations in 2007, and registered as a charity in 2008. This enables us to accept tax-deductible donations, but also means we have a fair amount of administration and accountability. We are now facing the challenge of ensuring the sustainability of the group by moving beyond an all-volunteer workforce. We have 2 classes of annual membership. Active members are involved as volunteers in the activities of the group and pay a $10 membership fee. Associate members (which can include groups) like to support the good work of the group but are unable to volunteer. Membership fee $20. Some people support our work through regular donations. Click here for a membership form, click here to donate. Our membership usually hovers around 120. We send an occasional email newsletter to members and supporters, and provide regular updates on our Facebook book. Our AGM is usually April or May. This frame over the bath was our nursery in the very early days. It is still there and gets used at the beginning of each pup season when we only have a handful of pups in. We grew out of the bathroom pretty quickly, but it wasn’t until 2012 that we had a bequest that paid for the Nursery building. High-rise living was our only indoor possibility for the first few years. We had to move the pups to the outside cage prematurely. We’d hang large sheets of cardboard to create the walls of an outdoor room, as well as cardboard on top, and set up a heater inside. 1. Wildlife care. 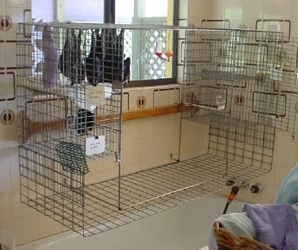 To rescue, rehabilitate and release all species of bats with a high standard of care, as well as provide a sanctuary for some of those who cannot be released. (ii) the education community, teachers and students of all ages and disciplines. 4. Habitat protection. Negotiate with landowners to facilitate the repair and protection of bat habitat, especially the Tolga Scrub. 5. Research. Support ethical research into the general ecology of bats and their management. 6. Advocacy. Advocate for conservation values of bats and their habitat. 7. Recognising the rights and responsibilities of Volunteers. Implementing an increasingly safe and harmonious volunteering environment. 8. Establishment of the Public Fund. 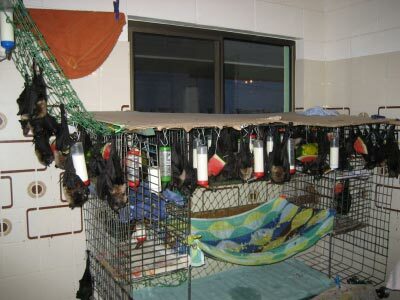 To establish and maintain a public fund to be called the Tolga Bat Hospital Fund for the specific purpose of supporting the environmental objects/purposes of Tolga Bat Rescue and Research Inc.
Our first cage, built in 1996, and replaced in 2004 with a steel/concrete cage known as Middle Cage (between the Microbat Cage and large Flight Cage) or Orphan Season cage.